We wouldn't be in this world without our moms. 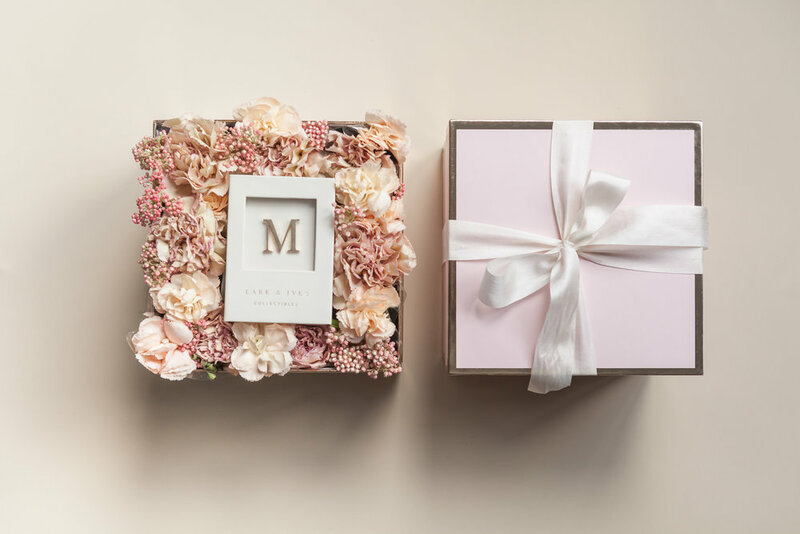 So, for this year's Mother's Day, we have crafted a beautiful floral box paired with our monogram pins, so that we can say a little thank-you to our moms for being so awesome and loving to us. These boxes will be available for purchase and for pick-up on May 12 10AM - 9PM, and on May 13 11AM - 7PM at Metrotown Indigo Chapters location. 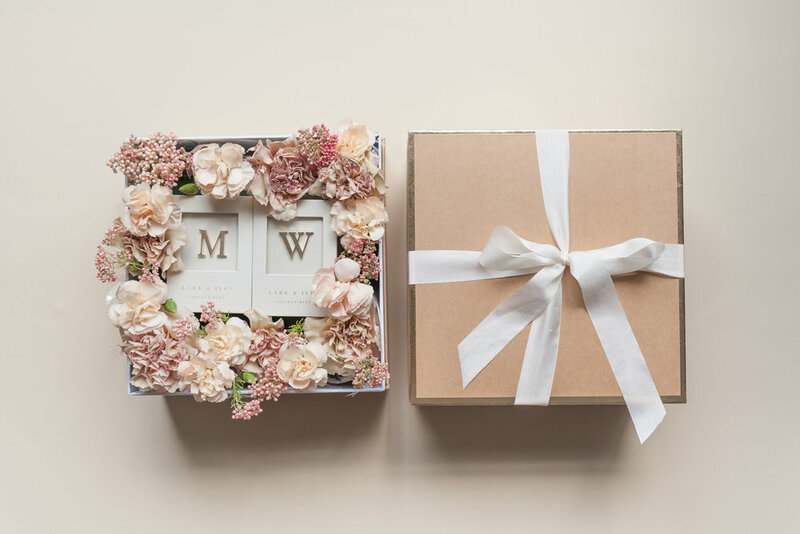 Each box will have a selection of fresh-cut flowers in a beautiful palette designed by Heather from Myrtle et Olive. We will have two sizes, a 6x6 box which includes 1 monogram pin, and an 8x8 box which includes two monogram pins. Want to add a little extra love for mom? Add a gold-foil printed card designed by Karla from Written Word Calligraphy and Design. A 6x6 box filled with beautiful fresh-cut flowers and one monogram pin. Choose between the white box or the pink box. Please select the monogram of choice, which can be the first letter of your mom's name, or just M for mom. The boxes will be available for pick-up at Chapters Metrotown from May 12-13. A 8x8 box filled with beautiful fresh-cut flowers and two monogram pin, inside a kraft box with gold trim. Please select two monograms of choice, which are great for your mother's initials! of all the moms in the world, I'm so glad that you are mine. Our Mother's Day card is lush with floral illustrations to match our flower boxes just in time for Mother's Day, designed by Karla of Written Word Calligraphy. 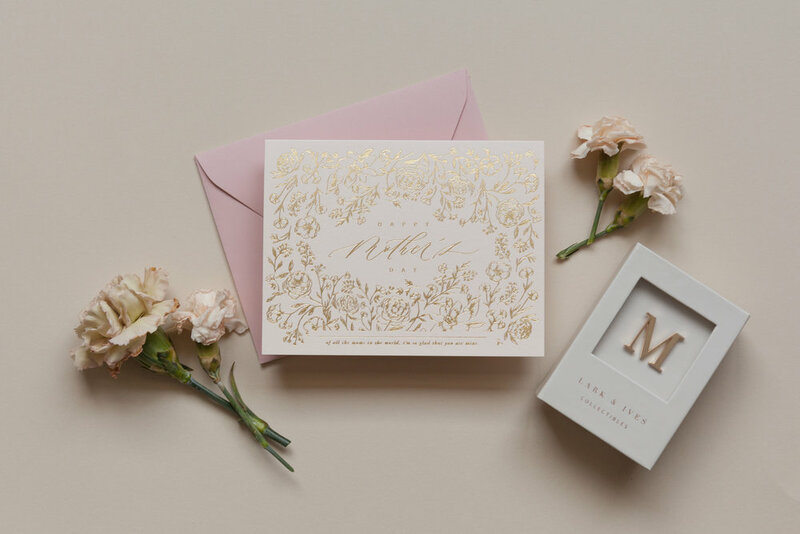 Printed in gold foil on blush paper, paired with a dusty rose envelope. This card is available for pick-up along with your boxes at Chapters Metrotown from May 12-13.